Many adults deal with back pain daily. When it's time for bed, that back pain can get even worse because of our sleeping positions. A back pillow can be a great and simple way to help alleviate back pain and get a good night's rest. Here are a few different back pillows for the bed to consider. Why Do I Need A Back Pillow? If you have a job that has you sitting at a desk all day, you might be putting a lot of strain on your lower back. This strain can cause your muscles to tighten up, and you can experience lower back pain. When you lay down at night, the position you sleep in can make your lower back pain even worse, and it also makes it very hard to get quality sleep. Back pillows are an easy way to help you put your back in a more comfortable sleeping position because they are designed to help align your spine and support your lumbar region. If you like to read or watch TV in bed, back pillows are also a good way to put you in the most comfortable position without adding any extra strain to your back. What Are The Different Kinds Of Back Pillows? There are a few different kinds of back pillows that you can use for your bed. The first kind is a wedge pillow that you place under your back and slightly raises your head up to alleviate pressure on your lower back. These can range from big wedges that are used to prop you up in bed to read or watch TV, to smaller wedges that you can use to sleep on. The second kind of back pillow is a bedrest pillow. This pillow has a large back and two arms that come out from each side. This kind of back pillow is only used for propping yourself up in bed and is not used for sleeping. Bed rest pillows usually only come in one size and have a handle to be easily moved on and off your bed. Finally, there are leg wedge pillows. These pillows are large wedges that are placed right under your knees and elevate your lower legs. Leg wedge pillows help position your legs so that your lower back has minimal pressure. These pillows work best for people who predominantly sleep on their back as they don’t help position your legs if you are a stomach or side sleeper. Back pillows come in all shapes and sizes, and the material will vary from each one. The most popular type of material on the market right now is memory foam. Memory foam is a special type of foam that molds itself to the contours of your body. Some people think this is ideal because it creates a customized fit to your own body. Other back pillows are made from standard foam. Some people like this option because the regular foam is a very supportive material. People who don't like soft beds or pillows will probably want to choose standard foam for their back pillow. It also tends to be a little less expensive than memory foam pillows. There are a few back pillows that are made from polyester fiber, but this usually pertains to bed rest pillows. This material is best for just supporting your back while you are reading or watching TV in bed, but not ideal for sleeping or correcting spinal alignment. Each material has its pros and cons, so you will have to decide what type of support you need from your back pillow. Where Can I Find A Back Pillow? The two best places to find a back pillow are either online or at a store that sells bedding supplies. Each option has its benefits as well as some negatives so you’ll have to decide which one works best for you. Shopping online allows you to look at hundreds of options. You can find any type of back pillow at the touch of a button, and there is a variety of sizes and styles. Online shopping also gives you the advantage of being able to read user reviews to see exactly what customers think of the product. You can also find a wide range of prices so you can get a pillow that is within your price range. The only downside to online pillow shopping is that you can't try the pillow before you buy it. Most online sites will allow you to send the pillow back if you are not happy with it, but you will have to check before you buy. Going to a store that sells bedding supplies give you the big advantage of being able to try the pillow before you purchase one. If you go to a store that specializes in pillows, you can also talk to associates who should be very knowledgeable about pillows and help you choose a back pillow that will fit your specific need. If you require a very specific type of back pillow due to a medical condition, it might be best to find a store that specializes in your specific need rather than shopping online. This allows you to make sure you are getting exactly what you need to help fix your problem. Here are some reviews of a few of the top rated back pillows for the bed. Start your search here for the best back pillow. This wedge pillow is great for those people that suffer from back or neck pain, acid reflux or gastroesophageal reflux disease (GERD). It can also help alleviate snoring problems and sinus issues. It is 2.4 pounds and comes in three different heights to suit your needs. The best thing about this pillow is that it can fold up for easy storage. This makes it easy to travel with as well as store out of sight when it is not in use. It also has a removable cover that makes it easy to wash. The pillow only comes in navy, so if you don’t like that color you might want to cover it with another pillow case. It is also made of very firm foam, so if you are looking for maximum support, this might be the best pillow choice. 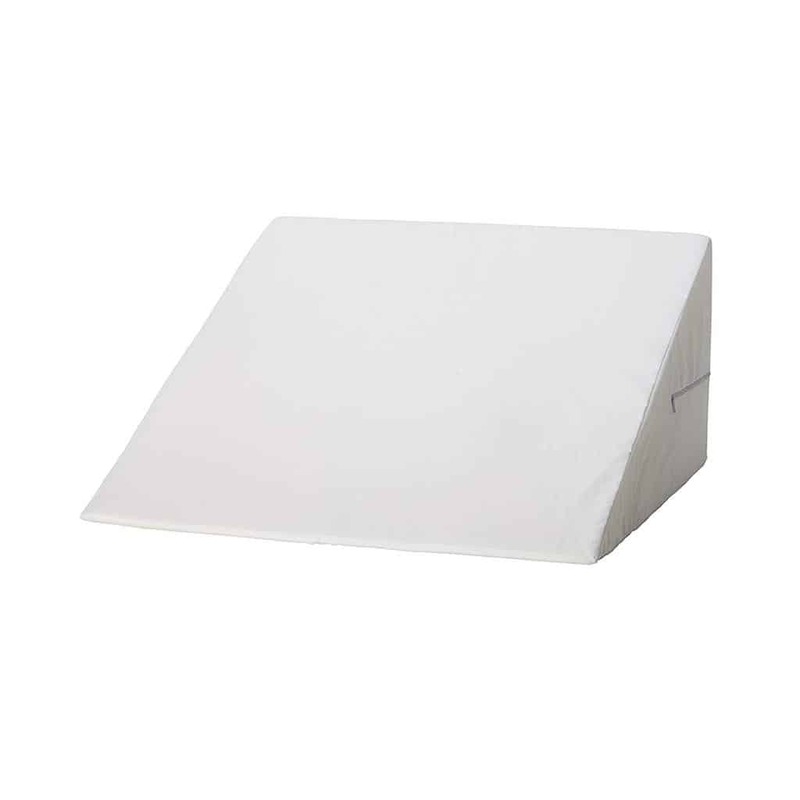 This bed wedge can be used in multiple ways. You can use it under your head and neck to help with acid reflux, neck pain, and shoulder stiffness. You can also use it under your knees to help align your spine and relieve pressure on your lower back. It is also great for propping yourself up to read or watch TV. It is lightweight at 2.2 pounds and comes with a removable cover so you can easily wash it. This wedge is made of very firm foam and might be great for people who need maximum support, but it can be a problem if you have a very sore or tender back. You can layer a few softer pillows on top of the wedge to help with comfort without adding any extra bulk or putting your neck at an uncomfortable angle. The pillow might also have a slight chemical smell when it is first opened, but after airing out for a few days the smell will disappear. This bed wedge pillow is made specifically to be placed underneath your legs to help alleviate back pain and improve circulation while you sleep. It is made of two layers of foam. The bottom layer is firm, furniture grade foam to provide optimal support, and the top layer is memory foam to provide comfort and conform to the shape of your body. It has a high-quality removable cover for easy washing, and they have also just started to offer a 400 thread count, 100% Egyptian cotton pillow cover that is sold separately. This pillow is a little heavier than other wedge pillows because of the double layers of foam, but it can provide more support as well. It is shipped vacuum sealed so that it is completely flat when it arrives, but will expand as soon as it is opened and maintain its shape. There might also be a slight chemical smell at first, but with a little airing out the smell will fade. This pillow is a little larger than most leg wedge pillows so that both legs can comfortably fit on top. This pillow is doctor recommended to help treat acid reflux and GERD. It is made of memory foam to help contour to your body’s shape as well as hypoallergenic isofresh odor neutralizer to help stop any bad odor. It is 30” wide, which is larger than most wedge pillows so that you can sleep on your back or side without it moving or sliding off the pillow. It also comes with a removable microfiber cover and the pillow should last 5 to 7 years. The pillow arrives compressed but will quickly attain its shape once the package is opened. It is a heavier pillow because of its large size, so it is not ideal for traveling. The memory foam alone might be a little softer for some people, so if you prefer a stiffer pillow, this might not be the best option. This is also a little pricier than other options, but lasts longer and provides a good deal of comfort. 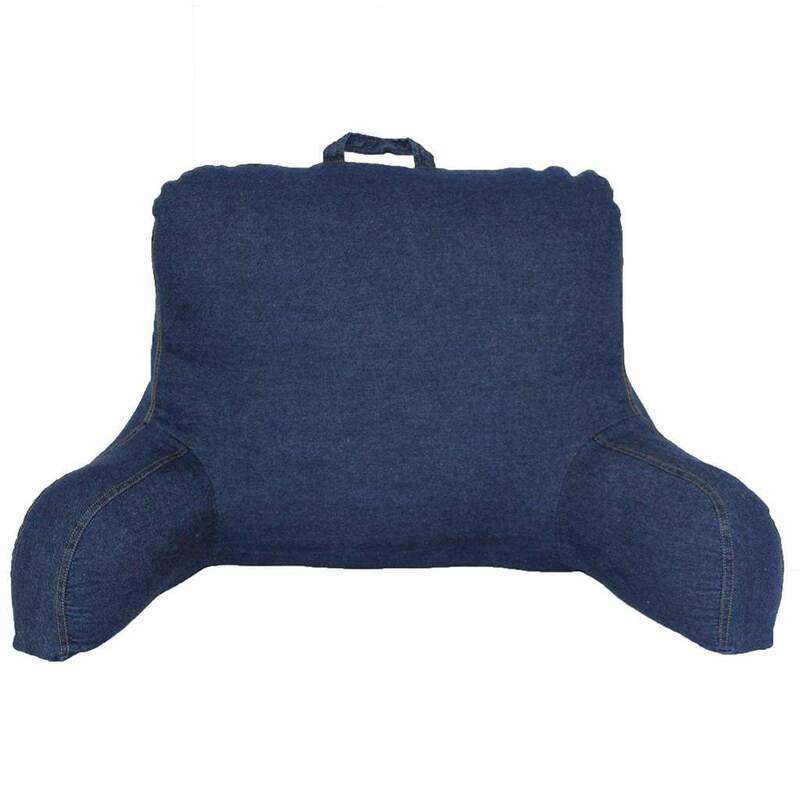 This backrest pillow is made to provide you extra support watching TV or reading while in bed or on the couch. It is filled with polyester fiber to make sure that it is very sturdy as well as comfortable. It comes in a variety of colors and styles so you can choose the one that fits best with your decor. It also has a handle for easy lifting and transport. This pillow is strictly for support while in seated positions and is not meant to be used while sleeping. It does not have a removable cover so that can make it a little more difficult to keep the pillow clean. Compared to other backrest pillows, this one is a little smaller so make sure that it fits your size requirements before you buy. Overall, it is a little less pricey than other brands and still offers good support and comfort.